A 25% deposit is required on booking with the balance due 8 weeks prior to arrival. A security deposit is required. Discounts are available for lets of 3 weeks or more and for long winter lets. ELYSIA PARK RESORT APARTMENT, is a 2 bedroom, top floor, luxurious apartment with superb direct sea views, part of the Elysia Park exclusive holiday resort complex in the Universal area of Kato Paphos, Cyprus. This beautiful apartment, stylishly furnished to a very high specification, has every convenience for a memorable holiday including UK TV system and free Wifi internet access. The apartment, sleeping up to 6 persons, has a double bedroom, a twin bedroom plus an additional double guest sofa-bed. Location/Facilities: The apartment is located in the central Universal area of Paphos, within walking distance of the Kato Paphos main resort and sea-front and the bustling town and local market areas. This new and exclusive resort complex features two stunning large waterfall swimming pools and a children's pool. It has private road access and is landscaped with beautiful gardens. The nearby Kato Paphos main resort comprises the local sandy beach and a large variety of shops, tavernas, restaurants and bars. Local archaelogical sites include the Tombs of the Kings and the ancient mosaics, ampitheatre, lighthouse and Byzantine fort near the bustling Paphos Harbour. Other resort facilities include a variety of boat trips, watersports, fishing, diving, horseriding and go-karting. 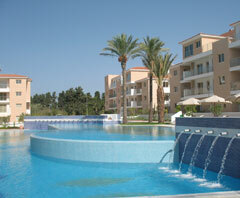 Also in the Kato Paphos resort area is the Aphrodite Wet & Wild water park. Guided tours include island-wide coach trips. Highly recommended is a jeep safari to explore the famous national park of the Akamas peninsular including the turtle beach or a safari to the mountains of Troodos to explore the traditional mountain villages and to climb to the top of Mount Olympus - the highest point of the island. The apartment is a 15 minute drive from the beaches at Coral Bay and the picturesque fishing harbour of St. George. All other amenities (banks, shops, pharmacy etc.) are within walking distance. All appliances and equipment including washing machine, fridge freezer, electric oven and ceramic hob, microwave, toaster, kettle. All crockery, cutlery and cookware. Stylish leather lounge suite (one a double sofa-bed) with quality, stylish solid oak furniture throughout. LCD 32" TV and IPTV system with UK terrestrial channels, internet/Wifi point, cards/games, CD/DVD player, air-conditioning/heating unit. Patio doors to the covered private veranda with patio furniture. A double bedded room with fitted wardrobes, solid oak furniture and beautiful bed-linen. Air-conditioning/heating unit. A twin bedded room with fitted wardrobes, solid oak furniture and beautiful bed-linen. Air-conditioning/heating unit. Stylish main bathroom with full size bath and overhead shower unit. Marble vanity unit. The apartment is provided fully cleaned with full fresh linen and towels, including pool towels. Additional cleaning/laundry is available on request during your stay - payable locally.